If you have access to decent bulk bins and a good farmer’s market, with a little preparation and perhaps a substitution here and there, you can prepare almost any recipe without producing waste. Just follow the rules below. When we first went plastic free in 2011, it took at least a couple of months to adjust to the new routine. We had to change how we shopped, where we shopped and what we ate: no more processed food and more real food. It wasn’t difficult. It was—and still is—a fun challenge. But at the time, some zero-waste menus would have really helped kickstart our transition. 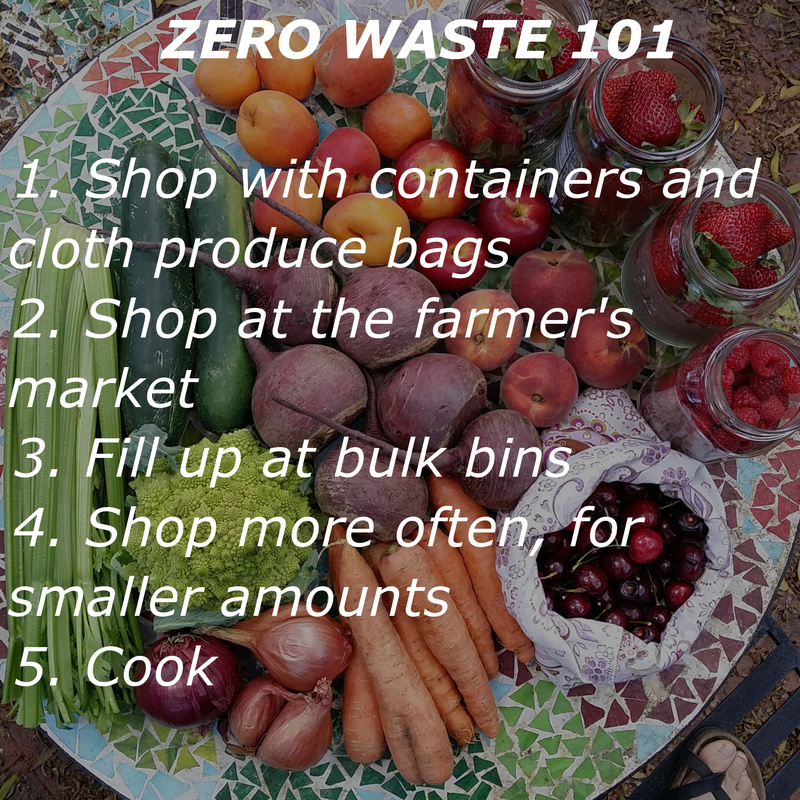 So, here is the third of (eventually) a week’s worth of zero-waste menus. You can read menu 1 here and menu 2 here. 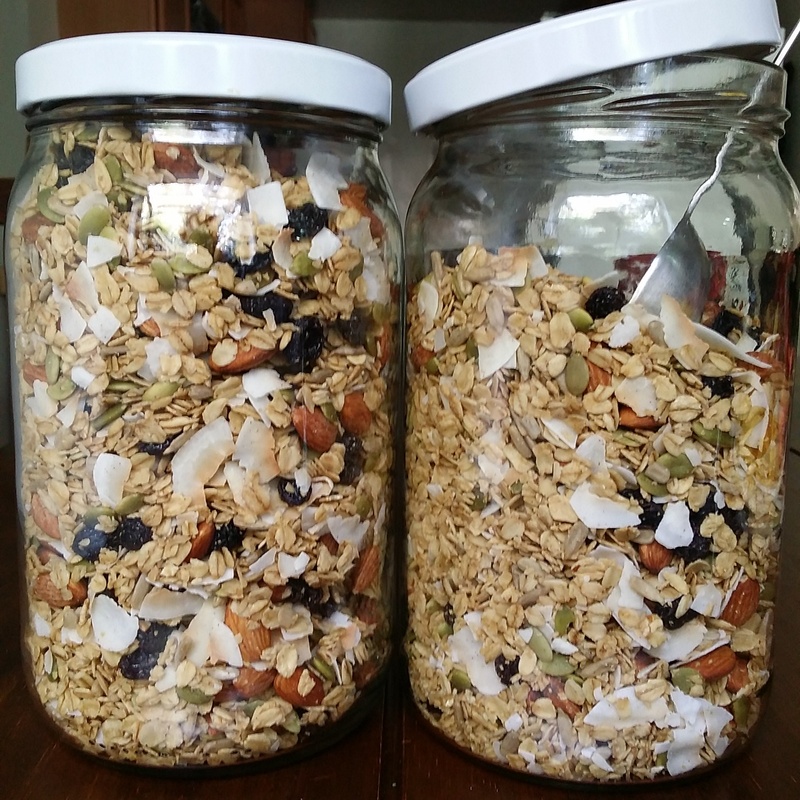 I make granola or I buy it at the store in bulk, using my jars. The store-bought stuff is quite sweet though. I like that I can control what goes into my homemade version. You basically mix together oats, nuts and seeds of your choice, oil and sweetener, then bake over low heat (300º F) for 20 or 30 minutes, stir every 15 minutes or so, cool and then toss in dried fruit. Granola is a bit of a use-it-up type of recipe. My daughter had made some almond shortbread and didn’t use up all the almonds she had ground up, so I added what was left to the batch pictured above. It tasted delicious! I also had a bit of barley rice syrup in the refrigerator so in it went as a sweetener—also very tasty. Top your granola off with seasonal fruit and yogurt (unsweetened and probiotic) or nut milk if you’re vegan. This is my basic granola recipe. I had to get my sourdough bread in one of these menus. (Here’s the recipe.) It tastes delicious and holds up well to a big slathering of hummus. Top it with seasonal vegetables for a delicious sandwich: lettuce, sliced cucumber, radishes, tomatoes, bell peppers, sprouts (I’ve been making them…so easy…post to come eventually…) and so on. Add cheese if you eat cheese. Enjoy fermented garlic-dill pickles on the side of your sandwich to get more probiotics into your gut. You can buy real dill pickles or make them when cucumbers are in season, following this easy recipe. To make hummus, rather than buy canned chickpeas (aka garbanzos), I use my pressure cooker to cook soaked beans in mere minutes (my pressure cooker changed my life). If you have leftover pickle brine or sauerkraut brine, you can add some of that to the hummus for a delicious tang and another little dose of probiotic goodness. Start with a small amount of brine (let’s say a couple of tablespoons), taste and add more until the hummus reaches your desired flavor and consistency. While food processor is running, slowly pour in olive oil. Process until all the oil is mixed in and the mixture is smooth. This is also my daughter’s recipe. It happens to be vegan. She used nutritional yeast in place of the cheese. If you prefer, use really good parmigiano reggiano and pecorino sardo. I have more trouble finding plastic-free cheese than anything else. 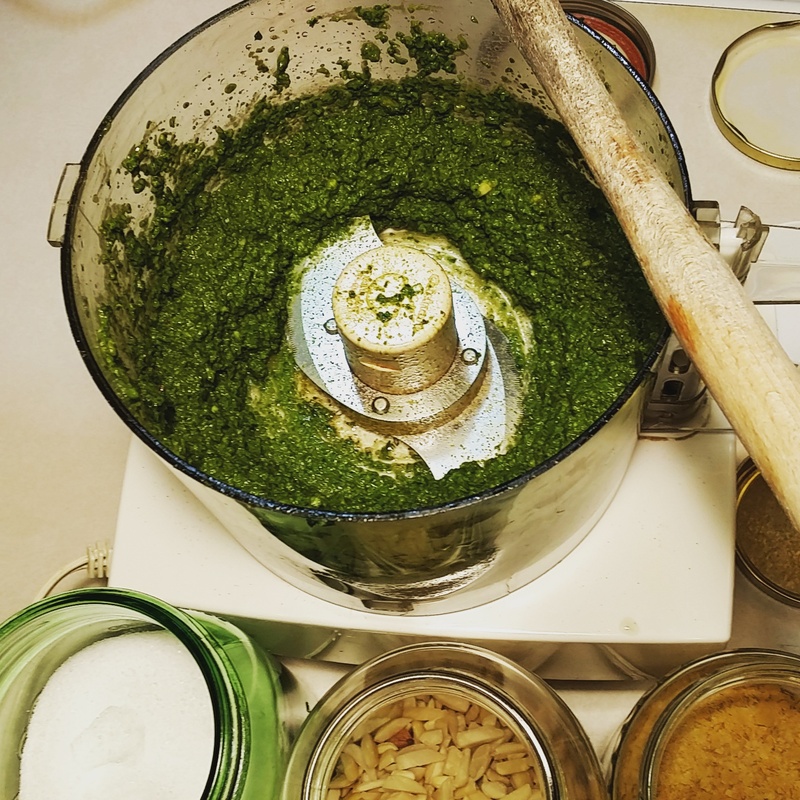 You can find the full post for vegan pesto here but I’ve also posted it below. You can eat this with pasta, zucchini noodles or spaghetti squash noodles. I love the veggie “noodles” but my younger daughter prefers pasta with her pesto so we usually eat it that way. With food processor running, slowly pour in olive oil. Process until smooth. Store in a glass container in the fridge. Pasta goes well with salad of course. We usually eat romaine or spinach. I chop my greens, wash them, spin them around outside in a cloth produce bag to dry and then toss them in a bowl along with chopped vegetables (carrots and celery because we always have them on hand, plus whatever else I find). Below is the recipe for balsamic vinaigrette. Whisk together ingredients in a measuring cup or bowl. Transfer to a glass bottle. Store in the refrigerator. We eat this within a couple of weeks.